In my previous article we discussed about setting local development environment using Cosmos DB Emulator for Windows. With this part 2 of the article, we will cover developing, debugging and integration related aspects of using Cosmos DB Emulator. Once you have Cosmos DB emulator installed and running on your machine, you can use any supported Cosmos DB SDK or Cosmos DB REST API to interact with emulator. This process is same as you are using a Cosmos DB cloud service. Cosmos DB Emulator also provides a build-in visual explorer through which you can view,create and edit collections and documents. Before you integrate Cosmos DB SDK or Cosmos DB REST API you would need to generate master key for authentication. Unlike cloud service, Cosmos DB emulator only support single fixed account and master key. You would not be able to communicate with Emulator without this master key. PS: This key is only to be used in Emulator. You cannot use the same key for Production(Cosmos DB Cloud Service). Furthermore, if you want to set your own key. You can go to command line references and run DocumentDB.Emulator.exe with sufficient command switch to set your own key. Remember it should meet the key security requirements. See command-line tool reference for more information. 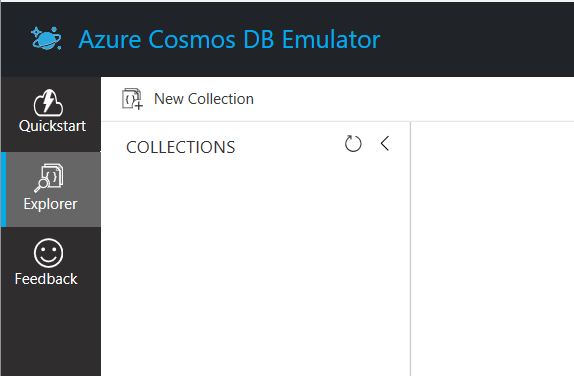 The Azure Cosmos DB Emulator is installed by default to the C:\Program Files\Azure Cosmos DB Emulator or C:\Program Files\DocumentDB Emulator directory. Once you have account name and key, you are good to go with development and debugging using Azure Cosmos DB emulator. Let us start looking at how to use CosmosDB SDK. Once you add Cosmos DB SDK for .NET from NUGET sources. You would need to import the following namespaces to reference necessary classes. In the above code block we are directly embedding endpoint, key in the source code.But as a suggested approch keeping in mind to easily point to production service would be maintain the key in Web.config appSettings. For the ease of this article, I am going to use the existing ToDoList sample from DocumentDB Samples provided by Microsoft. You can originally find the same source from C:\Program Files\DocumentDB Emulator\Packages\DataExplorer\quickstart. Now run the application in your Visual Studio. Hope this article was helpful for you with initial development. Share your feedback through comments and share this to your friends and colleagues. Microsoft has released Visual Studio for Mac, a revamped and renamed version of Xamarin Studio with little bit look and feel changes to make it look like Visual Studio product line has been released. With Visual Studio for Mac, you should be able to develop .NET/C#/ASP.NET based apps and XAMARIN Native and Forms based apps in Mac OS environment. Visual Studio for Mac comes with different editions like as in Visual Studio 2017/Xamarin Studio such as Community, Professional and Enterprise. Visual Studio Community for Mac – Free, fully-featured IDE for students, open-source and individual developers. Visual Studio Professional for Mac – Professional developer tools, services, and subscription benefits for small teams. Visual Studio Enterprise for Mac – End-to-end solution to meet demanding quality and scale needs of teams of all sizes. Go through Release Notes here for more details. .NET Framework 4.7 Developer Pack In order to add support for .NET Framework 4.7 in Visual Studio 2012 or later we need to install Developer Pack. Memory Limit Reactions. (Developers can now replace or supplement the default behavior by subscribing IObserver implementations to the application’s memory monitor. Announcing the .NET Framework 4.7 blog post to learn more about each of these improvements. .NET Framework 4.7 release notes. I was frustrated by this error when I am trying to reinstall Visual Studio 2017 after my visual studio got corrupted/failed during upgrade to 15.1 ( or after a previous installation failed due to low disk space). There is a file called ‘state.json’ , in below mentioned path, which is creating this particular issue. Delete/rename the folder as is or rename ‘state.json’ file to ‘something.json’ . Microsoft has released today the latest version of Visual Studio. The new Visual Studio 2017 will help you develop apps for Android, iOS, Windows, Web, and Cloud. It will also help you use version management, be agile, and collaborate effectively. Includes support for Xcode 8.3, iOS 10.3, watchOS 3.2, and tvOS 10.2 tools and APIs in the Xamarin.VS Extension for Visual Studio 2017..
Download the latest from: here , and you can fine the detailed list of fixes on the same site.